Now introducing our first Attendees' Bonus Auction, directly following the Live Webcast Auction! In an effort to bring back the real old-time auction feel, we are holding a 100-200 lot Bonus Auction following the Live Webcast Auction. The 100-200 lots of mostly bulk or multiple item lots will be offered only to bidders in attendance at our auction location. These lots will be sold as is, where is, and must be taken on the same day. We will have team members ready to assist you in loading your vehicle, if needed. No absentee or online bidding of any sort will be offered on the Bonus Auction lots. DESCRIPTION: Lot of jewelry - some early, much costume. DESCRIPTION: Diamond, onyx, and 10K tri-color gold gentleman's ring, finger size 10-1/2. Gross weight 5.6 dwt (8.7 g). DESCRIPTION: Ephemera lot of five early papers from 1700s to 1800s. From the Wing Family Collection. DESCRIPTION: Large ephemera lot (100+), some older, some newer. From the Wing Family Collection. DESCRIPTION: Large ephemera lot. From the Wing Family Collection. DESCRIPTION: Lot (5) horological books. From the Wing Family Collection. DESCRIPTION: Approximately 100 "Clocks" magazines from the 1980s. From the Wing Family Collection. DESCRIPTION: Book set of five volumes of "The Manufacturing Jeweler" circa 1884-1899. From the Wing Family Collection. DESCRIPTION: Lot (5) pieces of horological wall art, two professionally framed photos of a Howard watch, two framed posters from the NAWCC 2000 grand opening, and one of numerous Hamilton wristwatches. DESCRIPTION: Book and pamphlet lot including Jos. Bulova, Fried, Britten, etc. DESCRIPTION: Book and pamphlet lot, includes Britten, Clutton, Daniels, etc. DESCRIPTION: Book and pamphlet lot, includes Britten, Joseph Bulova, Fried, etc. DESCRIPTION: Book and pamphlet lot, includes Ehrhardt, Imai (Omega Speedmaster), Miller, Rolex, etc. DESCRIPTION: Book, catalog and pamphlet lot, includes Jardine, Wyler, Snowman, etc. DESCRIPTION: "Watch repairing" electric light-up sign, fully functional with toggle switch on back, measures 19 inches x 9 inches x 4 inches. DESCRIPTION: Good set of gold stamps, misc hand tools, etc. DESCRIPTION: Longines, Eterna, Citizen, Wyler and Wittnauer felt dealer pads. DESCRIPTION: Watch cases, trays, etc. DESCRIPTION: Assortment of desirable watchmaker's hand tools including numerous pairs of Dumont tweezers. DESCRIPTION: Complete watchmaker's lathe with numerous accessories. DESCRIPTION: Crate lot of tools, including pivot polisher, hair spring strength gauge, dial gauge. From the Wing Family Collection. DESCRIPTION: Good working Fordom dremel tool with accessories. DESCRIPTION: Hard to find collection of K&D (Kendrick and Davis) originally boxed hand tools including screwdriver sets, roller and hand remover, balance staff remover, mainspring winder, calipers, and more, along with three K&D catalogs. From the Wing Family Collection. DESCRIPTION: Jeweler's pantograph engraving set with numerous extra lettering sets, fine complete condition. DESCRIPTION: Large diverse assortment of watchmaker's tools and new old stock factory replacement parts as well as three mostly complete staking sets. DESCRIPTION: Large diverse assortment of watchmaker's tools and parts including a factory cabinet with parts from AS, Gruen and many more, also includes a complete staking set. DESCRIPTION: Large diverse assortment of watchmaker's tools, measuring equipment, case presses and much more. DESCRIPTION: Large diverse lot of watchmaker's tools, parts and accessories, highlights include a working ultrasonic cleaner and numerous glass pocket watch crystals, a fine lot for the watchmaker or enthusiast looking for a nice assortment. DESCRIPTION: Like new Watchmaster ultrasonic cleaner with numerous jars and replacement parts, including original manuals. Runs well when tested. DESCRIPTION: Lot (2) automatic wristwatch position testing machines, one single and one final tester for four separate watches. DESCRIPTION: Lot (2) German cuckoo clock and Peerless lathe base, motor and accessories. DESCRIPTION: Lot (2) watchmaker's staking sets. DESCRIPTION: Lot (3) boxes of watchmaker's tools, assorted complete and partial watches and a small assortment of books, highlights include a Bulova microsope and a fine working ultrasonic cleaner, a fine lot for the watchmaker or enthusiast looking for a nice selection of parts. DESCRIPTION: Small lot of watchmaker's tools, including a drill press and a timing machine, drill press has faulty cord and has not been tested. DESCRIPTION: Stamps, hand tools, demagnetizer, etc. DESCRIPTION: Tool lot including numerical punches, demagnetizer, etc. DESCRIPTION: Two partial staking sets, press, mvt holders, etc. DESCRIPTION: Watchmaker's lathe and a Bulova microscope. DESCRIPTION: LeCoultre, white gold-filled fancy case man's wristwatch, triple signed. DESCRIPTION: Assorted new old stock Wyler replacement parts and complete Wyler watches. DESCRIPTION: Fifteen boxes of new old stock mens' and ladies' wristwatch cases. DESCRIPTION: Large diverse assortment of desirable men's and ladies' wristwatch bracelets in steel and gold-filled, many NOS bracelets by JB Champion. DESCRIPTION: Large diverse assortment of men's and ladies' wristwatch bands in numerous styles and materials, numerous brands including Speidel, JB Champion and Hirsch. DESCRIPTION: Large diverse assortment of men's and ladies' wristwatch bracelets in gold-filled and stainless steel, numerous brands including JB Champion. DESCRIPTION: Large diverse assortment of wristwatch parts and material from numerous brands including Bulova, Gruen, Hamilton and more. DESCRIPTION: Lot (11) Swiss factor wristwatch movement assortments for ETA, AS and more. DESCRIPTION: Lot (3) boxes of watchmaker's tools, wristwatch parts and assorted accessories, including an assortment of glass wristwatch crystals, a fine lot for the watchmaker or enthusiast looking for a nice selection of parts. DESCRIPTION: Lot (3) boxes of watchmaker's tools, wristwatch parts and assorted accessories, parts from numerous brands including Omega, LeCoultre, Longines and numerous others, a fine lot for the watchmaker or enthusiast looking for a nice selection of parts. DESCRIPTION: Lot (4) boxes of watchmaker's tools, wristwatch parts and assorted accessories, includes parts from brands including Longines, Gruen, ETA and numerous others, a fine lot for the watchmaker or enthusiast looking for a nice selection of parts. DESCRIPTION: Lot (4) boxes of watchmaker's tools, wristwatch parts and assorted accessories, includes parts from numerous brands including Zenith, Eterna, Tissot and numerous others, a fine lot for the watchmaker or enthusiast looking for a nice selection of parts. DESCRIPTION: Lot (6) Illinois 0-size nickel wristwatch cases, new old stock in box. From the Wing Family Collection. DESCRIPTION: Lot (80) men's and ladies' mostly leather new old stock wristwatch straps. DESCRIPTION: Organised Bestfit cabinets filled with new old stock parts. DESCRIPTION: Small cabinet filled with mechanical and quartz movements in unused condition. DESCRIPTION: Sorted crystal cabinet with mounted case press and screw back opener. DESCRIPTION: Large lot of complete wristwatches of various styles and makes. DESCRIPTION: Lot (13) Car clocks, 8 day - includes 3 Rim Winds, 1 Lemania, 5 Waltham, 1 Elgin, 1 New Haven, 1 Goodwich Tire advertising, 1 partial; along with two additional crystals; several clocks run but most do not run. DESCRIPTION: Lot (4) Horological items including two bank vault timers, a desktop calendar clock marked the USS Vega, and an advertising desk clock for the "Chemo Company." DESCRIPTION: Large assortment of clock parts and pendelums. DESCRIPTION: Lot (3) mantle clocks - all split column cases with wooden works by Buckland, Mass. maker Wm Sherwin, one is dial only with fine eagle hands, other two have complete movements, dials, some weights. From the Wing Family Collection. DESCRIPTION: Small lot electric and quartz clocks, small hand tools and more. DESCRIPTION: Small lot of partial and complete clocks and accessories. DESCRIPTION: Wooden dial lot including fine "R. Whiting, Winchester," "Silas Hoadley," four unmarked, one very poor. From the Wing Family Collection. DESCRIPTION: Assorted staffs, stems and tools for wrist and pocket watches. DESCRIPTION: Incredibly large lot of NOS replacement parts, several organized cabinets; a watchmaker's dream of sorted sealed parts, numerous brands including Bulova, Hamilton, Gruen and so many more, mostly wristwatch parts. DESCRIPTION: Elgin 18S B.W. Raymond with fancy yellow gold OF case. DESCRIPTION: Hamilton 18S, "W.H. Jericho, Special, Mt. Pleasant, IA," in an OF case. DESCRIPTION: Hampden 16S yellow gold-filled HC pocket watch with Masonic dial. DESCRIPTION: Illinois 18 size hunting model, "Currier," Blauer 4 oz coin silver case with late steel chain. DESCRIPTION: Illinois 18S hinged cover coin silver OF with private label "W.H. Story, Hillsborough." DESCRIPTION: Illinois, 17J, private label, in a massive 65mm HC. DESCRIPTION: New York Watch Co., John Hancock, KWKS, coin silver HC. DESCRIPTION: Tremont Watch Co, 18S, KWKS, massive coin silver HC. DESCRIPTION: United States Watch Co, Marion, NJ, 18S, KWKS, massive coin silver case. DESCRIPTION: Waltham 18S "Home Watch Co" early coin silver HC, KWKS, in Civil War era case with great patina. DESCRIPTION: Waltham Model 57, 18S, large coin silver HC pocket watch. DESCRIPTION: Large case lot (45) gold-filled pocket watch cases of various styles and designs. DESCRIPTION: Large lot (45) American nickel 18S OF incomplete pocket watch cases. DESCRIPTION: Assorted watchmaker's tools and replacement parts, including staffs, stems and crowns. DESCRIPTION: Eight trays of Swiss and American pocket watch movements. DESCRIPTION: Large assortment of early parts including staffs, hands, jewels and more. DESCRIPTION: Large load of European pocket watch movements. DESCRIPTION: Lot (11) cabinets - [1-7] Plastic crystal cabinets with thousands of organized crystals. [8-11] Glass pocket watch crystal cabinets, three completely full and all organized. All in ready to use condition with press. This lot should supply both glass and plastic crystals for many, many years. DESCRIPTION: Lot (29) fusee pocket watch movements. DESCRIPTION: Lot (7) Newall American and Swiss wooden boxed assortment of stems, crowns and balance jewels for Hamilton and Illinois. DESCRIPTION: Three Seitz wood boxed vials of hole jewels. DESCRIPTION: Three tray lot of complete and partial pocket watches as well as loose pocket watch dials, nice selection for the enthusiast or the watchmaker in search of good parts. DESCRIPTION: Three tray lots of miscellaneous American and European pocket watch dials, including desirable railroad watch dials, truly a fantastic lot for the collector, dealer or watchmaker looking for a nice dial assortment. DESCRIPTION: Wooden pocket watch carrying case containing four running watches, two Hamilton dials and 10 empty cases of various materials including gold-filled, silver and nickel, two of which are display cases. DESCRIPTION: Lot (2) 18S OF Rockford pocket watches, one KWKS, the other SW-LS. DESCRIPTION: Lot (2) American includes Hampden 18S in coin silver HC and Elgin in a coin silver OF case. DESCRIPTION: Lot (2) Elgin 18S in massive 4 oz coin silver OF case and Elgin "Leader" coin silver OF. DESCRIPTION: Lot (2) Elgin 18S, KWKS, coin silver OF pocket watches. DESCRIPTION: Lot (2) European chronograph watches. DESCRIPTION: Lot (2) Hampden 18S and 16S yellow gold-filled HC pocket watches. DESCRIPTION: Lot (2) pocket watches, includes Elgin 18S sterling silver OF with lady's picture imprinted on the dust cover and Elgin 18S OF KWKS in a massive 4 oz coin silver case. DESCRIPTION: Lot (3) American railroad watches by Hamilton, Illinois and Elgin. DESCRIPTION: Lot (3) American watches, two in silver cases, one in a nickel case, highlights include an early Waltham eagle marked silver hunter case with three digit serial number. DESCRIPTION: Lot (3) European pocket watches, two in silver cases one in a nickel display case with a fully capped chronometer grade movement. DESCRIPTION: Lot (3) European watches, two in gun metal cases one in a silver case. DESCRIPTION: Lot (4) 18S OF pocket watches by Elgin, Waltham and Hampden. DESCRIPTION: Lot (4) English fusee pocket watches. DESCRIPTION: Lot (4) gold-filled pocket watches. DESCRIPTION: Lot (4) key-wind American pocket watches. DESCRIPTION: Lot (4) silver HC European pocket watches. DESCRIPTION: Lot (4) silver OF cased pocket watches, one is a fusee private label for "Sanborn of Lowell, Mass." DESCRIPTION: Lot (5) European silver pocket watches in HC and OF cases. 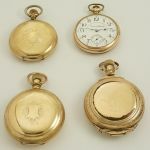 DESCRIPTION: Lot (6) key-wind pocket watches. DESCRIPTION: Lot (6) pocket watches, includes four silver OF hinged KWKS, one Swiss open face with fancy dial, and one 8 day travel clock. DESCRIPTION: Lot (10) complete and partial pocket watches. DESCRIPTION: Lot (11) complete and partial pocket watches. DESCRIPTION: Lot (14) complete and partial pocket watches. DESCRIPTION: Dollar watch lot (15) clean ones. DESCRIPTION: Lot (20) semi-modern, dollar, and other pocket watches, 13 run, 7 not running, all but 3 appear complete, a few others missing hands, bezel or crystal, conditions vary, please inspect at auction before bidding.